Meet the Friendeshans. A lovable race of beings! 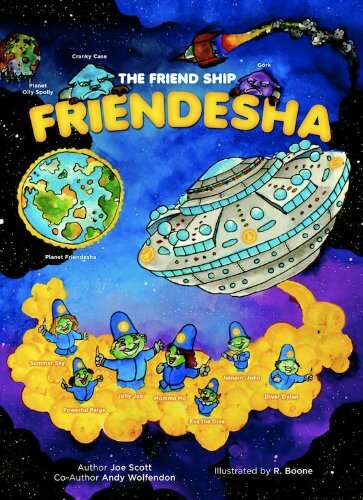 Meet the Friendeshans, a lovable race of beings who spread friendship and positive energy throughout the galaxy! In this book, the Friendeshans encounter the Oily Spoilies, creatures that thrive on meanness and negativity. What will happen when an Oily Spoily spy gets aboard the Friendeshans’ ship? 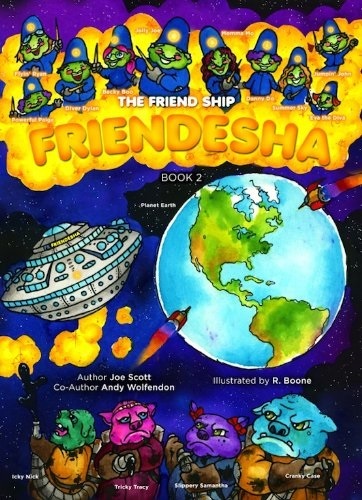 The Friend Ship Friendesha: Book 2 revolves around Kiley, a seven-year-old first-grade girl who loves books, science, and outer space. Her Grandpa Gus has been watching the spaceships hovering in the sky above his home. Kiley and Grandpa Gus think that the giant flying oil can is full of friends. The story continues as the Friendeshans show Kiley’s friends and family how positive energy can be spread throughout the land and universe. 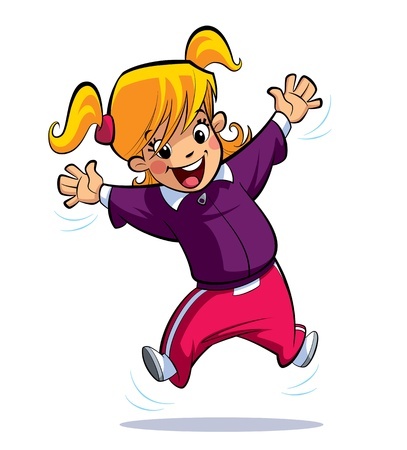 We learn no matter the situation you get into, there are two ways to react: being positive and nice, or nasty and negative. The outcome can help cure a problem or create one. 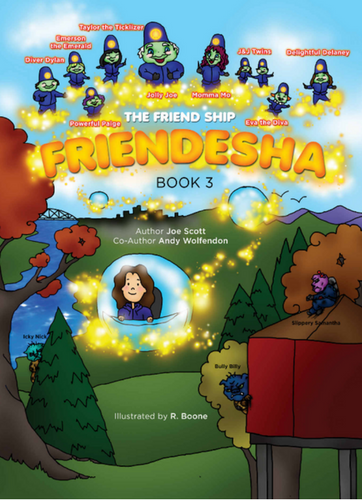 READ WHAT PEOPLE ARE SAYING ABOUT THE FRIEND SHIP FRIENDESHA . . .
I’m obsessed! I have not read a new children’s story for quite a while but quickly remembered how much I love them. The adventure drew me right in and the illustrations are delightful. I am looking forward to what happens in the second book…quite a challenge ahead! Who wouldn’t benefit from a little Friendesha now and again? Or, a lot! Wonderful theme and fantastic artistry. Read this cooly illustrated book with my five year old niece (first for me and third for her). The book was age appropriate and fun to read/discuss. Amazing how she could relate the negative/positive characters to friends and grow-ups she interacts with. Joe Scott’s book (Author of The Joe Dial) has a simple message of being positive and you will effect others. I hope it turns into a series. Looks like the Friend Ship next stop is Earth. We need it. 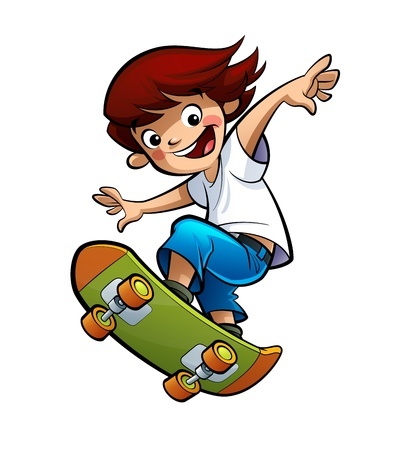 Amazon Customer – Joe C.